Wow! Thanks for a great challenge last week, your Floral cards were beautiful! Our challenge theme this week is a color challenge. We challenge you to make cards that are black and white with a splash of one other color for our heroes to send home to their family and friends! We can’t wait to see your card creations! Our sample card maker this week is Sue! To see more of her awesome creations please visit her blog “Little Bits of Randomness”. Thank you Sue for sharing your awesome creativity with us! Sue…Thanks for the great inspiration! 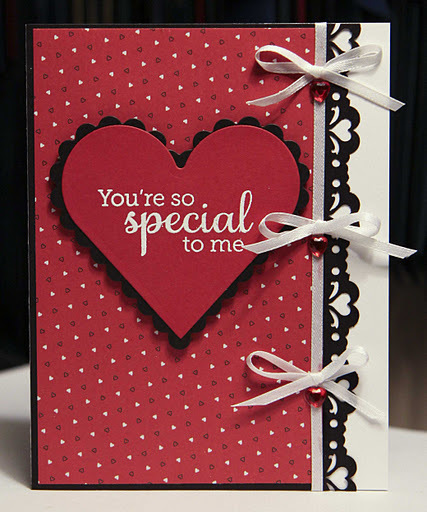 I love black white and red – can't wait to make my card this morning!!!!! Thank you Sue for being our sample card maker this week, I LOVE your gorgeous black & white with a splash of color card! Love your card Sue. Nicely detailed, but not so fussy it would make the man in your life cringe. And the black/white/red–what's not to love, right? Sue, your card is awesome! I love the 3 bows with that pretty punch!